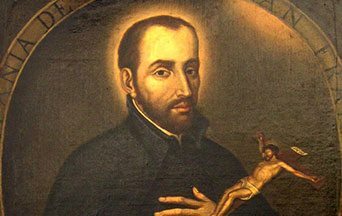 Saint John Francis Regis was born in the village of Fontcouverte, in the southern province of Aude, France, on January 31, 1597. His father, Jean, was a rich merchant who, in recognition of the prominent role he had taken in the Wars of the League, had been recently ennobled. His mother, Marguerite de Cugunhan, belonged by birth to the landed nobility of that part of Languedoc. His parents watched with Christian solicitude over the early education of their son, and young John Francis’ sole fear was to displease his parents or his tutors. The slightest harsh word rendered him inconsolable, and quite paralyzed his youthful faculties. When he reached the age of fourteen, he was sent to continue his studies in the Jesuit college at Béziers. His conduct was exemplary and he was much given to practices of devotion, while his good humor, frankness, and eagerness to oblige everybody soon won for him the good-will of his comrades. But Francis did not love the world, and even during the vacations lived in retirement, occupied in study and prayer. On one occasion only did he allow himself the diversions of the chase. At the end of his five years’ study of the humanities, grace and his ascetic inclinations led him to embrace the religious life under the standard of Saint Ignatius of Loyola. He entered the Jesuit novitiate of Toulouse on December 8, 1616, the Feast of the Immaculate Conception of the Blessed Virgin Mary. Here he was distinguished for an extreme fervor, which never afterwards flagged, neither at Cahors, where he studied rhetoric for a year (Oct., 1618-Oct., 1619), nor during the six years in which he taught grammar at the colleges of Billom (1619-22), of Puy-en-Velay (1625-27), and of Auch (1627-28), nor during the three years in which he studied philosophy in the scholasticate at Tournon (Oct., 1622-Oct., 1625). During this time, although he was filling the laborious office of regent, he made his first attempts as a preacher. On feastdays he loved to visit the towns and villages of the neighborhood, and there give an informal instruction, which never failed—as attested by those who heard him—to produce a profound impression on those present. As he burned with the desire to devote himself entirely to the salvation of his neighbor, he aspired with all his heart to the priesthood. In this spirit he began in October, 1628, his theological studies. The four years he was supposed to devote to them seemed to him so very long that he finally begged his superiors to shorten the term. This request was granted, and in consequence Francis said his first Mass on Trinity Sunday, June 15, 1631; but on the other hand, in conformity with the statutes of his order, which require the full course of study, he was not admitted to the solemn profession of the four vows. The plague was at that time raging in Toulouse. The new priest hastened to lavish on the unfortunate victims the first fruits of his apostolate. In the beginning of 1632, after having reconciled family differences at Fontcouverte, his birthplace, and having resumed for some weeks a class in grammar at Pamiers, he was definitively set to work by his superiors at the hard labor of the missions. This became the work of the last ten years of his life. It is impossible to enumerate the cities and localities which were the scene of his zeal.1 We need only mention that from May, 1632, to September, 1634, his headquarters were at the Jesuit college of Montpellier, and here he labored for the conversion of the Huguenots, visiting the hospitals, assisting the needy, withdrawing from vice wayward girls and women, and preaching Catholic doctrine with tireless zeal to children and the poor. 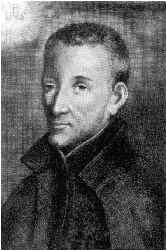 Later (1633-40) he evangelized more than fifty districts in le Vivarais, le Forez, and le Velay. He displayed everywhere the same spirit, the same intrepidity, which were rewarded by the most striking conversions. Saint John Francis Regis one day met a rich lady, who was well known throughout the country for her great zeal in spreading her religion. She was a Calvinist. After receiving instructions, she was admitted into the Catholic Church by the Bishop of Viviers in France, and for the rest of her life was most zealous in propagating the true Faith which God had so wonderfully given her. Rev. D. Chisholm, The Catechism in Examples (London: R & T Washbourne, Ltd., 1919), 268-70. Less moderate indeed was his love of mortification, which he practiced with extreme rigor on all occasions, without ruffling in the least his evenness of temper. As he returned to the house one evening after a hard day’s toil, one of his confrères laughingly asked: “Well, Father Regis, speaking candidly, are you not very tired?” “No”, he replied, “I am as fresh as a rose.” He then took only a bowl of milk and a little fruit, which usually constituted both his dinner and supper, and finally, after long hours of prayer, lay down on the floor of his room, the only bed he knew. He desired ardently to go to Canada, which at that time was one of the missions of the Society of Jesus where one ran the greatest risks. Having been refused, he finally sought and obtained from the general permission to spend six months of the year, and those the terrible months of winter, on the missions of the society. The remainder of the time he devoted to the most thankless labor in the cities, especially to the rescue of public women, whom he helped to persevere after their conversion by opening refuges for them, where they found honest means of livelihood. This most delicate of tasks absorbed a great part of his time and caused him many annoyances, but his strength of soul was above the dangers which he ran. Dissolute men often presented a pistol at him or held a dagger to his throat. He did not even change color, and the brightness of his countenance, his fearlessness, and the power of his words caused them to drop the weapons from their hands. 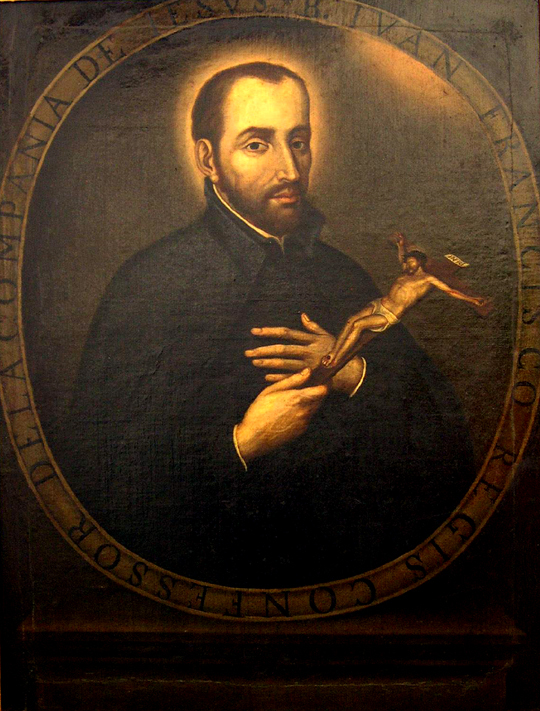 18th century painting of Saint John Francis Regis in the Church of Saint Ignacius, Bogotá, Colombia by Gustavo Adolfo Vives Mejía. He was more sensitive to that opposition which occasionally proceeded from those who should have seconded his courage. His work among penitents urged his zeal to enormous undertakings. 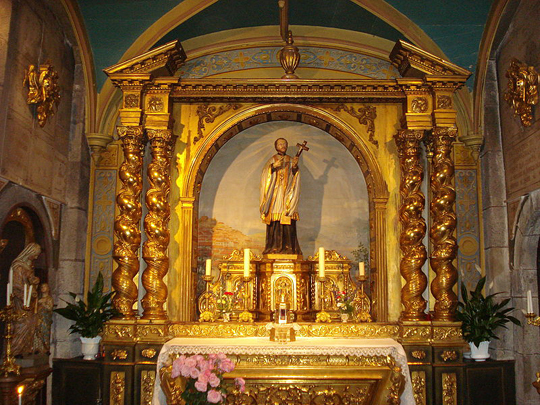 The altar and statue of Saint John Francis Regis, Notre-Dame du Collège Church, Puy-en-Velay, France. It was in the depth of winter, at la Louvesc, a poor hamlet of the mountains of Ardèche, after having spent with heroic courage the little strength that he had left, and while he was contemplating the conversion of the Cévennes, that the saint’s death occurred, on December 30, 1640. There was no delay in ordering canonical investigations for his canonization process. On May 18, 1716, the decree of beatification was issued by Clement XI. On April 5, 1737, Clement XII promulgated the decree of canonization. And Benedict XIV established the feastday for June 16. But immediately after his death Regis was venerated as a saint. Pilgrims came in crowds to his tomb, and since then the concourse has only grown. 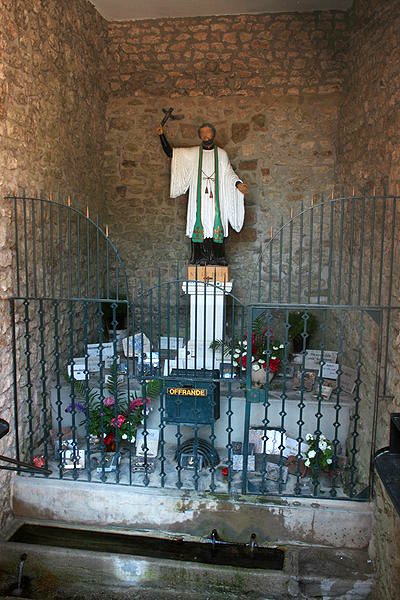 Mention must be made of the fact that a visit made in 1804 to the blessed remains of the Apostle of Vivarais was the beginning of the vocation of the Blessed Curé of Ars, Jean-Baptiste Vianney, whom the Church has raised in his turn to her altars. “Everything good that I have done”, he said when dying, “I owe to him.”4 The place where Regis died has been transformed into a mortuary chapel. Nearby is a spring of fresh water to which those who are devoted to Saint John Francis Regis attribute miraculous cures through his intercession. The fresh water spring in the village of la Louvesc, to which devotees of Saint John Francis Regis attribute miraculous cures through his intercession. Cfr. The Catholic Encyclopedia, (New York: Robert Appleton Company, 1910), Vol. VIII, pp 464-465. On this subject the reader must consult his modern biographer, Father de Curley, who has succeeded best in reconstructing the itinerary of the holy man. Besides the biographies mentioned in CARAYON, Bibliographic Historique de la Compagnie de Jésus, nn. 2442-84, must be mentioned the more recent lives: DE CURLEY, Saint Jean-François Régis (Lyons, 1893), which, together with DAUBENTON’S work—often reprinted—is the most complete history of Regis; CROS, Saint Jean-François Régis (Toulouse, 1894), in which the new portion consists of unedited papers regarding the saint’s family. Among the early biographers LABRONE, a pupil of the saint, occupies an unparalleled place for the charm, the sincerity, and the documentary value of the relation. His book appeared in 1690, ten years after the death of the saint. This entry was posted in Catholic Perspective and tagged apostolate, Catholic doctrine, Father's Day, John Francis Regis, Preacher, Saint, Saint John Francis Regis: The Saint for Father’s Day, tireless zeal by Francis Van Ortroy. Bookmark the permalink.